Ninjatoes' papercraft webpage – Have fun building! 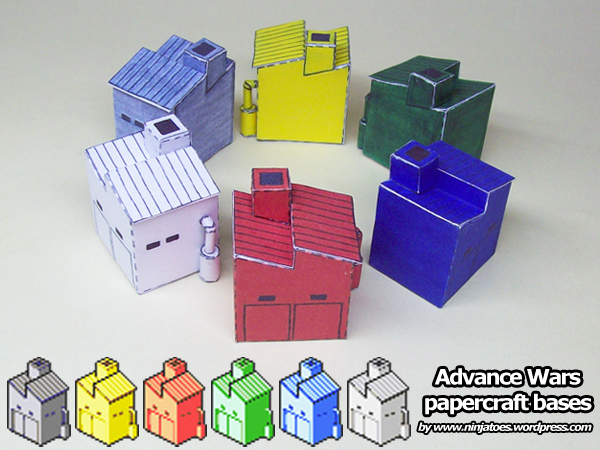 Which papercraft model would you like to download? Well, that’s when (in this case ;o) you print a page of parts (preferably on some thicker paper) cut them out and fold them, and then glue them together to make your very own 3D paper model of your favourite game/anime/movie character/whatever you like! Currently, I have one-hundred-and-eighty-six (186) models in stock for you. Select one of the Categories above or in the sidebar to the right to find the model you wish to download (if it’s not in one of the obvious categories, try the miscellaneous section). If you want to contact me, or send me a picture of your finished paper model for the hall of fame, you can send me an e-mail at ninjatoes@home.nl and I’ll get back to you as soon as I can. Are there going to be more lego designs ? Buildable options for bricks 1×1 1×2 1×3 2×2 2×3 2×4 2×2 slope would be awesome to be able to build a house for the paper figs. Would love to see hotdog guy Mr gold bumblebee girl brick boy and girl and a option to stick together … In in love w. Thr paper lego and some of the groups I’m in people are going crazy over them as well. But there are really lots more if you search around a bit. Sorry that I can’t promise you anything, but I hope you understand it’s only a hobby of mine to make papercrafts. ;o) Have fun!